Not a bad puzzle game. I had a fun time figuring out how to get around, however the enemies are a bit too quick to return to fighting after being defeated. I did notice a weapons rack that I was able to walk through. I really like the pushing and pulling box mechanic I think it's a great way to keep the boxes from getting stuck. The random elements to healing, saving, and combat are interesting, but I do not think they leave much control to the player which can be very frustrating. The ability to escape from combat would be nice but you will have to do something about the enemies just attacking immediately again. Very well done and interesting! This kept my attention the whole way through and really nailed what it was going for. This game will help you understand certain people better. The characters seem cool, but there are a lot of bugs right now especially in the intro. The text is very hard to read and the dialogue drags on and on. The characters all have the same health and mana. Not really into this one but maybe others will feel different. Some cool puzzles. This is really good! I love the artwork and witty dialogue. It reminds me of games like Disgaea. My only suggestion would be to add controller support. Super cool game I am going to put more time into it after I try out a few other submissions. I like the style. I love the style and the exploration but I feel like the battles are a little bit too difficult. The guardian stance and provoke system is creative it just seems like the monsters have more than enough time to beat someone to death before you can set up the provoke and still kill them. Following for sure! This is the full playable demo that has been submitted for IGMC 2017. The game is based on traditional old-school tabletop D&D. The world is covered mostly by water with one large continent and several smaller, the game takes place on the largest continent and it's outer islands. This world is connected by a vast series of underground tunnels where humans used to live as slaves to monsters. Forbidden from using magic or weapons of any kind humans learned to develop their bodies and minds to fight back against their slavers and break free to the surface world. Upon settling on the surface humans discovered quickly that the surface world was dominated by xenophobic elves that had absolutely no tolerance for any other races and attempted to wipe out humanity. Humanity managed to survive and settled mostly on the outer islands. 1000 years later humans and elves are still no closer to peace but humans have developed much in magic and technology, martial arts were only passed down from single masters to their students and were all but lost to the ages. The gameplay is the focus, with each character representing an archtype and their class fulfilling a primary role. As an experienced dungeon master I want to make a game that creates a typical fantasy RPG experience with fun mechanics. As this is my first game ever, I need as much feedback as I can possibly get so I can become better at this! 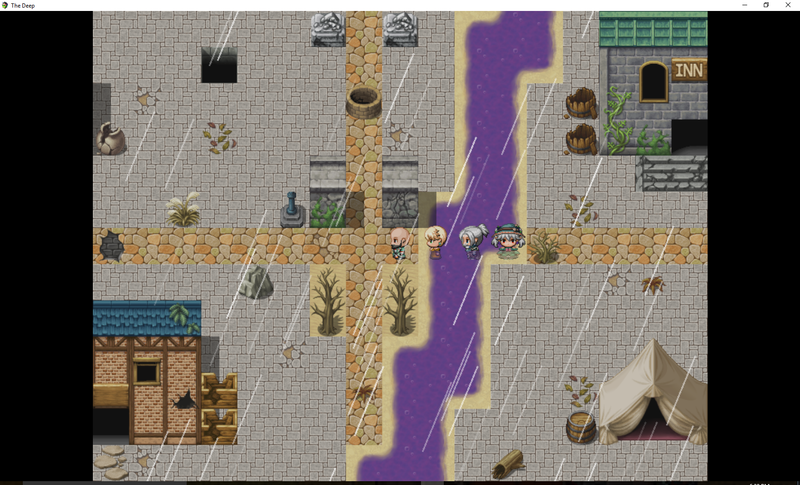 Thanks to this contest I have discovered I love the RPG Maker MV platform and want to make many, many more games after (or possibly while) I finish this one!